Dusky Moorhen, Gallinula tenebrosa, Warriewood Wetlands, 25.8.2012 by Michael Mannington. Chestnut Teal, Anas castanea, Warriewood Wetlands, 25.8.2012 by Michael Mannington. 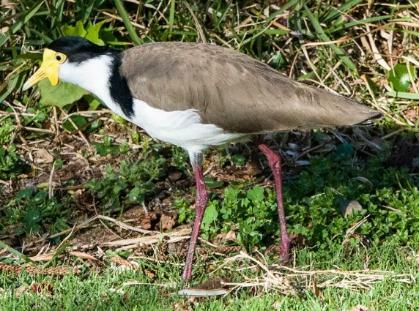 Masked Lapwing, Vanellus miles, previously known as the Masked Plover and often called the Spur-winged Plover. Breeding starts after Winter Solstice. Picture by Michael Mannington. Find out more about Pledge 2 Fledge HERE. About the Global Birding Initiative: GBI is an online hub for links to information about birding opportunities, festivals, conferences, associations, educational programs, and conservation efforts worldwide. By providing birders with accessible resources and opportunities to help them effectively share their appreciation for birds with others, GBI strives to creatively inspire global interest in birds, birding and, by extension, the natural world. In doing so, GBI encourages birders to generate participation in birding, engender appreciation for birds in individuals and communities around the world, and heighten awareness of bird conservation issues among the general public. More Here or on Facebook. 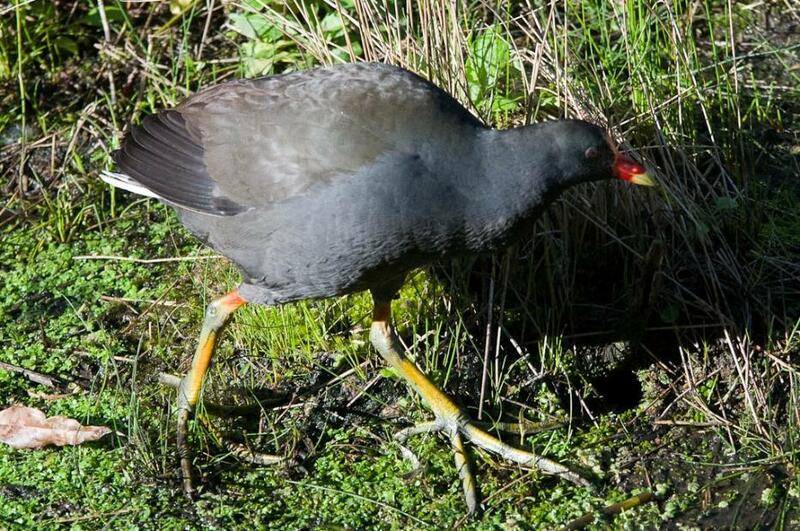 This beautiful bird, a Dusky Moorhen, Gallinula tenebrosa, has been inhabiting the swamps and estuaries of Australia for at least one thousand years. Dusky Moorhens are related to Purple Swamphens which are considered to be the ancestors of several island species including the extinct Lord Howe Swamphen and two species of Takahē in New Zealand. These purple cousins are, despite a tendency to clumsiness when taking off or landing, birds that are capable of flying great distances over sea and have made themselves at home in Papua New Guinea, Samoa and Indonesia. 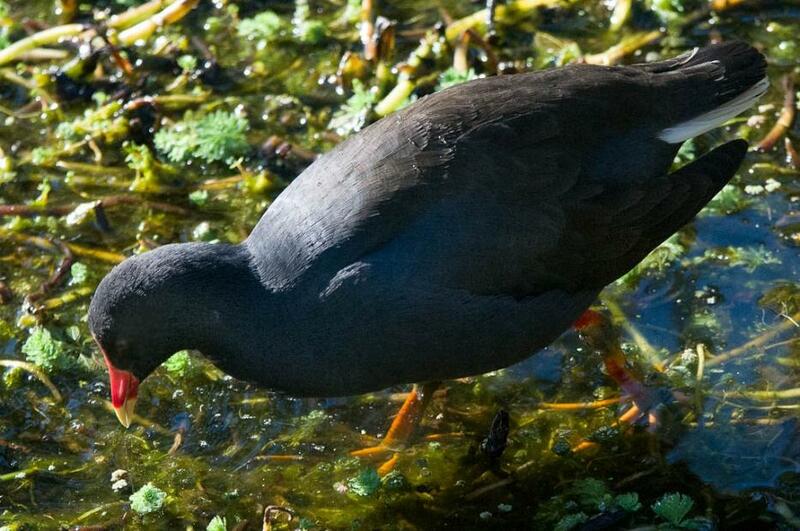 Dusky Moorhen's breeding season begins in August. The Dusky Moorhen forms breeding groups of two to seven birds, with all members defending territory, building nests and looking after young. The shallow platform nests are made of reeds and other water plants over water, among reeds or on floating platforms in open water. Two or more females will lay their eggs in the same nest and all members of the group help to incubate the10-18 eggs per clutch and feed the young. Young chicks are fed by their parents (and group members) for between 10–14 days, after which they begin to feed themselves. The male has an elaborate courtship display, holding water weeds in his bill and bowing to the female with loud chuckles. The other bird pictured here is a female or juvenile Chestnut Teal, Anas castanea, whose breeding season is July to November each year. 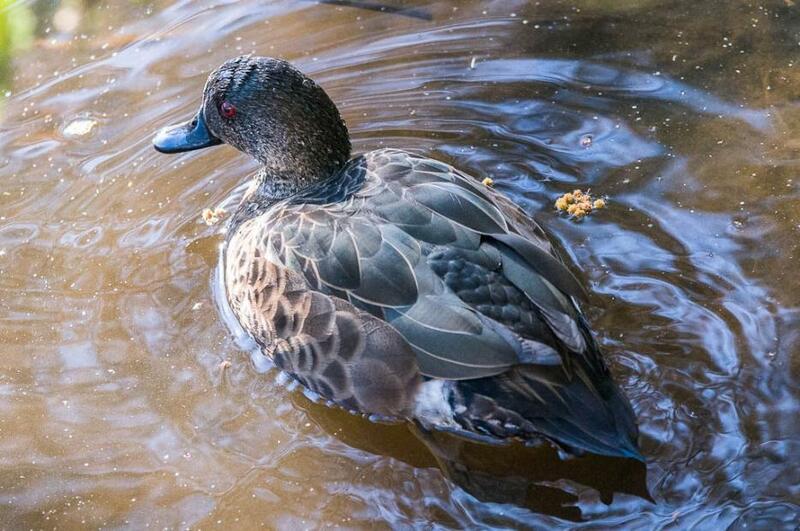 Chestnut Teals are found on wetlands and estuaries in coastal regions, and is one of the few ducks able to tolerate high salinity waters, but still requires fresh water for drinking. It will also use open freshwater lakes, reservoirs and sewage ponds during drought seasons. 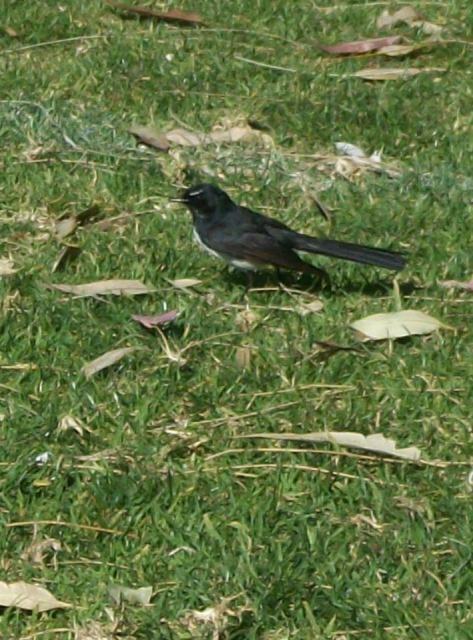 It mainly breeds in coastal areas, needing hollow trees in water or short grasslands near water for nesting. Males are distinctive, having a glossy green head, chestnut brown neck, breast and flanks, dark brown upper body and wings, and a black undertail with contrasting white patch. Females are mottled dark brown and grey, with a pale throat streaked brown and a dark eye stripe. In both sexes the eye is a deep red, the bill is blue-grey and the legs and feet are green-grey. The wings have a dark glossy green to purple speculum (panel) edged white and the underwing is brown, with white wing pits. Alan is the Australian Ambassador for Pledge2Fledge and has also been wandering around Warriewood wetlands with a young birder yesterday and ten other birders. The Pledge 2 Fledge people ‘See Birds, Share Birds, Save Birds’. These great Pittwater wetland's bird pictures have been taken by Michael Mannington, our fearless photographer/reporter, among the reeds and creeks of the beautiful Warriewood wetlands early Saturday morning (25.8.2012). The Willy Wagtail, Rhipidura leucophrys, and bees collecting pollen were also taken on Saturday morning at Careel Bay wetlands. These tiny birds are also in their breeding season (July through December) and are quite fearless, chasing off much larger kookaburras, magpies and eagles who stray into their territory. 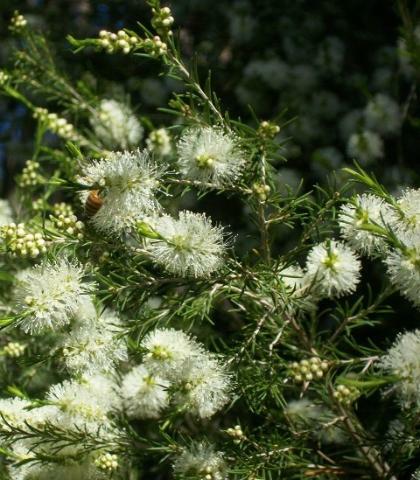 Spring is most definitely heralded gloriously by all these new bird songs and busy bees. Images by Michael Mannington of Volunteer Photography, 2012. All Rights Reserved.